Home on Cameron is located at 315 Cameron Street., Alexandria, VA. We’re in a row house from the 1800’s that was originally a tobacco warehouse. Minutes from Washington D.C. on the Potomac River, Old Town Alexandria delights travelers from all over the world. 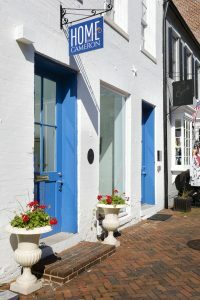 A nationally designated historic district founded in 1749 that George Washington called home, Old Town Alexandria hums with more than 200 independent restaurants and boutiques alongside intimate historic museums and new happenings at the waterfront. Old Town’s cobblestone streets and red brick sidewalks attracts everyone from presidents to pet lovers. The Old Town Alexandria location offers underground and municipal parking lots close by for easy access. Alexandria’s history reaches back more than thirteen thousand years. From the first Native Americans to settle here, to the bustling city it is today, the timeline of Alexandria’s history is filled with events that helped shape the United States of America into the country it is today. A vital seaport during colonial times, Alexandria is George Washington’s hometown and part of the original Washington, DC. Thomas Jefferson entertained guests at Gadsby’s Tavern; Civil War general Robert E. Lee moved to Alexandria with his family when he was only four years old, and would eventually become one of the most famous figures in the American Civil War. Alexandria served as one of the largest slave trading ports prior to the Civil War, but once occupied by Union forces from the onset of the Civil War, the city was both vital in the defense of the nation’s capital and essential in the war effort as a transportation and hospital center for the Union. Even before the war, Alexandrians were making history toward achieving equality: The Edmonson sisters became figures of the anti-slavery movement after they tried to escape Alexandria and were caught in 1848. Their story sparked a national controversy as activists struggled to free them. The founder of Alexandria’s Apothecary Shop, Edward Stabler, was also a famous member of the anti-slavery movement, as he used his own money to buy slaves, and then grant them freedom until his death in 1831. In the 1930’s, famed Alexandria African-American attorney Samuel W. Tucker was one of the key architects of the Civil Rights Movement. Alexandria’s Old Town district was established in 1946 as only the third historic district designated in the United States. Its remarkable concentration of historic buildings with a detailed past create a rich backdrop for today’s vibrant contemporary lifestyle. United States President Gerald R. Ford also called Alexandria home: the 38th president of the United States lived in his home in Alexandria’s Clover neighborhood until shortly after being appointed to the presidency.